Setting the dgText property or creating an array and setting the dgData property of a data grid is the easiest way to display your data. But what about situations where creating an array is too time intensive and you already have the data in another format? 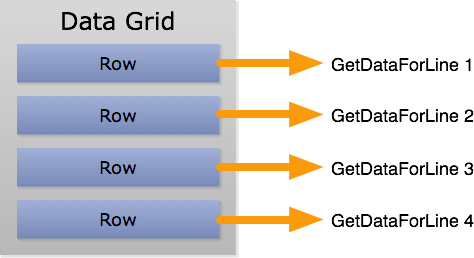 A data grid can handle these situations for you as well using a feature called callbacks. Download the attached sample stack and database that shows how to use the techniques described in this lesson to display data from a SQLite database. Normally a data grid reports the number of records based on the number of numeric indexes in the first dimension of the dgData array. If you set the dgNumberOfRecords property, however, the data grid stops using an internal array and issues a callback message whenever it needs to display data in a line. You can define this handler in the data grid script or anywhere else in the message path. Just fill in pDataA with the appropriate data and the data grid will display it. Prev: What Sorts of Things Should I Not Do In Order To Avoid Needless Suffering?